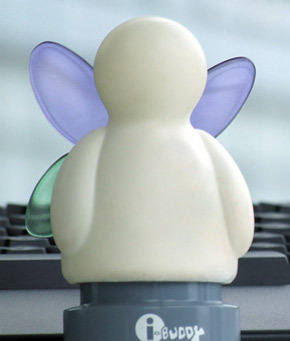 Created for compatibility with MSN Messenger, the i-Buddy appears to be a watered-down wannabe version of a Nabaztag. The device connects via USB and reflects emoticons received from your friends. If a happy emoticon is received, the gadget will flap its wings and light up, however if a angry emoticon is received, it will turn red. If only the device wasn't output only, we'd love to try it out as a tethered voodoo doll against our friends who are too stubborn to switch to Gtalk. Well, what was the last odd thing I saw? Right. I just saw someone feature an iPod dock made out of lego blocks. They remind me of my childhood. anyway, this i-Buddy gadget seems cool but who would really bother buying something like this?